The brief written by Blake Stafford (JD ‘17), Matt Cloutier (JD ‘17), and Mia Falzarano (JD ‘17), the law school’s 2017 National Moot Court champions, has earned first place in the National Moot Court Competition’s Scribes Brief Writing Award. The team’s brief also earned the overall Best Brief award at the moot court competition. The brief, primarily authored by Stafford, was one key to the team’s success, because the brief counts for 40 percent of the total score in each round of the competition. Professor John Korzen (JD ’91), director of the law school’s Appellate Advocacy Clinic, was the team’s coach. Since 1996, Scribes has presented an annual award for the best student-written brief. Scribes believes that legal writing is of paramount importance to law students and their careers, and it hopes to encourage good legal writing by recognizing its finest examples. Scribes opens the competition in late spring, and it receives submissions until August. Once Scribes receives all submissions, they are judged by professors, judges, and practicing attorneys. The top 15 to 20 briefs then go to the Brief-Writing-Award Committee. It reads the briefs, deliberates, and choose the top three briefs. 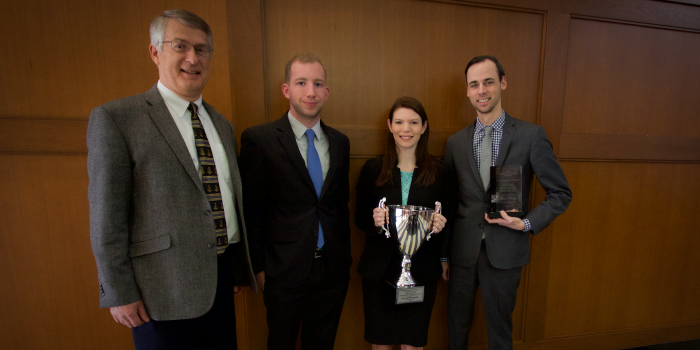 The Wake Forest National Moot Court brief was chosen as the very best out of all of the past year’s submissions. Scribes will host a Continuing Legal Education (CLE) event at John Marshall Law School in Chicago on April 13, 2018, when the authors will be presented the award at an annual luncheon.